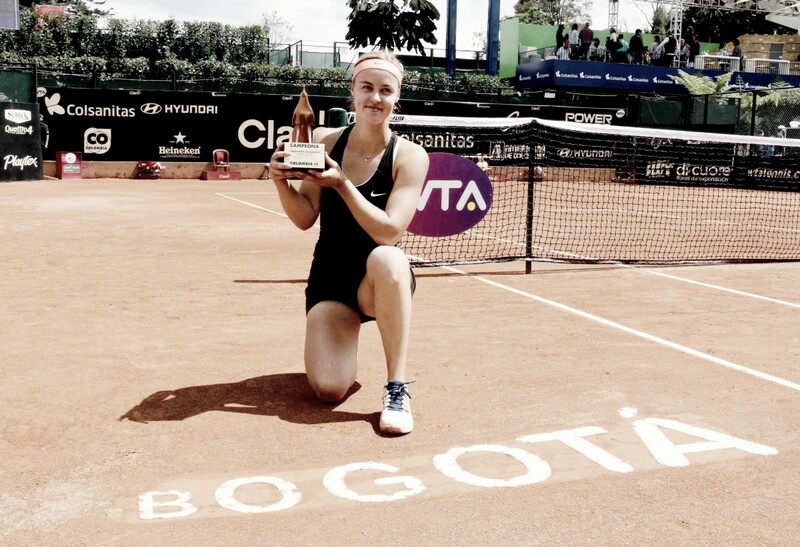 It has been a scenic route but Anna Karolina Schmiedlova finally found her top form once more, returning to the top-100 with an excellent showing in Bogota which saw her claim her third WTA career title. Anna Karolina Schmiedlova made a stunning return onto the WTA tour after coming out of nowhere to grab the title at the Copa Colsanitas, defeating three-time finalist Lara Arruabarrena with a relatively straightforward 6-2, 6-4 scoreline despite suffering from a slight wobble towards the conclusion of the match. Having reached a career-high ranking in a breakthrough 2015 season, Schmiedlova endured through a shell-shocking drought which saw her go on a 16-match losing streak in WTA main draw matches which spanned over seven months, and ultimately resulted in a fall out of the top-200 in the rankings. This triumph in Bogota will now send her back into the top-100 for the first time since 2016, with her hard work finally being rewarded with success as it guarantees her a spot in the main draw of Roland Garros this year. From being bageled in the opening match against Irina Falconi, little would anyone expect Schmiedlova to show glimpses of her old form, storming to claim the title without losing more than six games in any of her next matches. Whereas, Arruabarrena repeated her run from 2017, reaching the final once more having lost just 16 games in her path to the championship match. Arruabarrena started her surge for the title in the best possible manner, firing on all cylinders as she easily overpowered a slow-starting Schmiedlova for a love break in the opening game. However, the Spaniard failed to hold onto her lead as the Slovakian started to find her range, moving her opponent all around the court in the tricky conditions. Schmiedlova had the golden opportunity to earn the first service hold in the third game, but completely lost the plot from 40-0 up as Arruabarrena produced the perfect reply and the Slovakian started to make a slew of unforced errors, gifting the lead to the world number 79 once more. After what seemed like an eternity, Schmiedlova finally grabbed the first hold with some spirited play before Arruabarrena crumbled under the pressure of playing catch-up on the scoreboard. Going for the lines, Schmiedlova was putting up a clay-court masterclass and eventually closed out the opening set 6-2 after just 34 minutes. There seemed to be yet another momentum shift with Arruabarrena starting the second set in similar fashion, grabbing the opening break but was then immediately pegged back by Schmiedlova, who exploited her opponent’s leaky net play. As mentioned by the commentator, Arruabarrena seemed like a sitting duck at the net, and her tactics clearly broke down after Schmiedlova stormed to a commanding 5-1 lead in the second set within a blink of an eye, being just a game away from victory. However, nerves started to kick in just when the finishing line was in sight. The Slovakian owned a match point on her serve, but produced countless errors to gift Arruabarrena one of the breaks back. Three consecutive games came and went, with the Spaniard all of a sudden finding herself back level on serve. Fortunately, Schmiedlova regained her composure in time and calmed her nerves down to find her groove, with her monstrous forehands being a deadly weapon having helped her to seal the comfortable 6-2, 6-4 victory after an hour and 19-minutes of play.